LCD display is an inevitable part in almost all embedded projects and this article is about interfacing a 16×2 LCD with 8051 microcontroller. Many guys find it hard to interface LCD module with the 8051 but the fact is that if you learn it properly, its a very easy job and by knowing it you can easily design embedded projects like digital voltmeter / ammeter, digital clock, home automation displays, status indicator display, digital code locks, digital speedometer/ odometer, display for music players etc etc. Thoroughly going through this article will make you able to display any text (including the extended characters) on any part of the 16×2 display screen. In order to understand the interfacing first you have to know about the 16×2 LCD module. 16×2 LCD module is a very common type of LCD module that is used in 8051 based embedded projects. It consists of 16 rows and 2Â columns of 5×7 or 5×8 LCD dot matrices. The module were are talking about here is type number JHD162A which is a very popular one . It is available in a 16 pin package with back light ,contrast adjustment function and each dot matrix has 5×8 dot resolution. The pin numbers, their name and corresponding functions are shown in the table Â below. VEE pin is meant for adjusting the contrast of the LCD display and the contrast can be adjusted by varying the voltage at this pin. This is done by connecting one end of a POT to the Vcc (5V), other end to the Ground and connecting the center terminal (wiper) of of the POT to the VEE pin. See the circuit diagram for better understanding. The JHD162A has two built in registers namely data register and command register. Â Data register is for placing the data to be displayed , and the command register is to place the commands. The 16×2 LCD module has a set of commands each meant for doing a particular job with the display. We will discuss in detail about the commands later. High logic at the RS pin will select the data register and Â Low logic at the RS pin will select the command register. If we make the RS pin high and the put a data in the 8 bit data line (DB0 to DB7) , the LCD module willÂ recognizeÂ it as a data to be displayed . Â If we make RS pin low and put a data on the data line, the module will recognize it as a command. R/W pin is meant for selecting between read and write modes. High level at this pin enables read mode and low level at this pin enables write mode. E pin is for enabling the module. A high to low transition at this pin will enable the module. DB0 to DB7 are the data pins. The data to be displayed and the command Â instructions are Â placed on these pins. LED+ is the anode of the back light LED and this pin must be connected to Vcc through a suitable series current limiting resistor. LED- is the cathode of the back light LED and this pin must be connected to ground. 16×2 LCD module has a set of preset command instructions. Each command will make the module to do a particular task. The commonly used commands and their function are given in Â the Â table below. The steps that has to be done for initializing the LCD display is given below and these steps are common for almost all applications. Send 0FH for making LCD ON, cursor ON and cursor blinking ON. Send 06H for incrementing cursor position. Send 01H for clearing the display and return the cursor. Sending data to the LCD. The steps for sending data to the LCD module is given below. I have already said that the LCD module has pins namely RS, R/W and E. It is the logic state of these pins that make the module to determine whether a given data input Â is a command or data to be displayed. Make RS=0 if data byte is a command and make RS=1 if the data byte is a data to be displayed. Place data byte on the data register. Pulse E from high to low. Repeat above steps for sending another data. The circuit diagram given above shows how to interface a 16×2 LCD module with AT89S1 microcontroller. Capacitor C3, resistor R3 and push button switch S1 forms the reset circuitry. Ceramic capacitors C1,C2 and crystal X1 is related to the clock circuitry which produces the system clock frequency. P1.0 to P1.7 pins of the microcontroller is connected to the DB0 to DB7 pins of the module respectively and through this route the data goes to the LCD module. Â P3.3, P3.4 and P3.5 are connected to the E, R/W, RS pins of the microcontroller and through this route the control signals are transffered to the LCD module. Resistor R1 limits the current through the back light LED and so do the back light intensity. POT R2 is used for adjusting the contrast of the display. 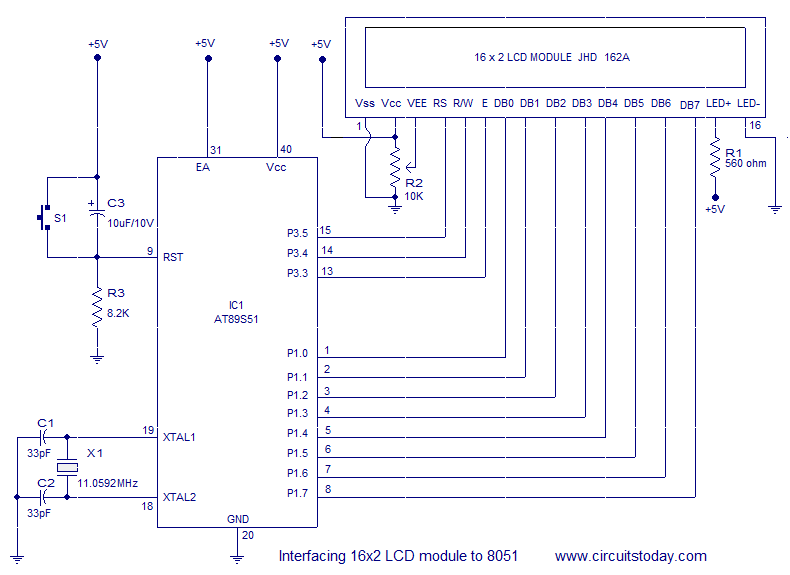 Program for interfacing LCD to 8051 microcontroller is shown below. Subroutine CMND sets the logic of the RS, R/W, E pins of the LCD module so that the module recognizes the input data ( given to DB0 to DB7) as a command. Subroutine DISP sets the logic of the RS, R/W, E pins of the module so that the module recognizes the input data as a data to be displayed . 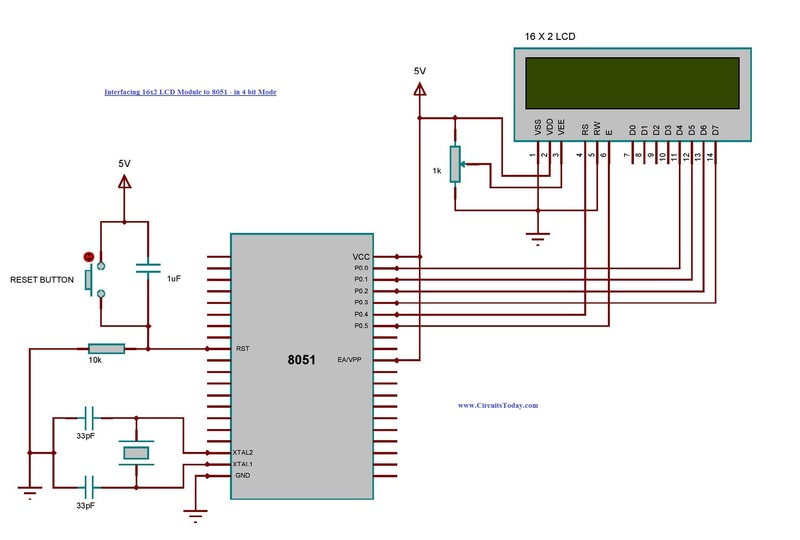 Use a single port of the microcontroller for both data and control lines of the LCD. As shown in the circuit diagram, port 0 of the controller is used for interfacing it with LCD module. In 4 bit mode only 4 lines D4-D7, along with RS, R/W and E pins are used. This will save us 4 pins of our controller which we might employ it for other purpose. Here we only need to write to the LCD module. So the R/W pin can be ground it as shown in the schematic diagram. In this way the total number of pins can be reduced to 6. In 4 Bit mode the data bytes are split into two four bits and are transferred in the form ofÂ a nibble. The data transmission to a LCD is performed by assigning logic states to the control pins RS and E. The reset circuit, oscillator circuit and power supply need to be provided for the proper working of the circuit. Â Â Â Â Â Â Â The programming part is done in assembly language instead of embedded C. As mentioned earlier the 8 bit data is break into two 4 bit data and send to LCD. A subroutine called â€œSPLITTERâ€ is used in the programÂ for Â slicing 8 bit data into nibbles. It uses two memory location â€˜Uâ€™ and â€˜Lâ€™Â for storing the upper and lower nibbles. The subroutine named â€œMOVEâ€ is used to put the upper and lower nibbles into the data pins of the LCD by making a high to low pulse at the E pin of the LCD module. If we need to send a command, â€œLCD_CMDâ€ is used. In this subroutine the RS pin of the LCD is cleared in order to notify the LCD that the byte at its data pin is a command. And subroutineÂ labeled â€œLCD_DISPâ€ is used for sending data. Here the RS pin is set which will notify the LCD that the byte arrived is a data for displaying. The necessary commands for the LCD initialization are defined at the end part of the program. Along with that the text to be displayed is also defined there with a label â€œTEXT1â€. â€œLINE1â€ AND â€œLINE2â€ labels contains the commands for selecting the 1st and 2nd rows of the LCD respectively. is it possible to interface two LCD’s with single 8051 using same control & data pins? is it possible to interface two LCD’s with 8051 using same pins for control and data? There is nothing appearing on lcd.Please help! you need to initialize the lcd first ..
Thankyou for taking the efforts! hi nothing is appearing on my lcd, circuit is ok and program is copied from yours. Could you explain me how DELY subroutine produces the delay? I mean, when the condition will be met if the program write a full-ones word at P1 every time? It means, if bit 7 of accumulator is SET (that is 1), then jump to the delay routing labelled DELY. I hope you understood 🙂 Any more doubts ? can anybody send me circuit and programming of sms based home appliance control system? please try to think this circuit by IC ULN2003 at the place of transistors. Thank you Rowan. Please try it. Comment if you come across any doubts.